Hörmann has installed more than 1200 industrial loading bay products at two John Lewis Partnership sites in Magna Park 3, Milton Keynes. The John Lewis Partnership is launching its own version of Dragon’s Den – with a category for smarter supply chain. John Lewis Partnership has chosen the Virtualstock IT platform to provide a collaborative workspace for the retailer and its suppliers. 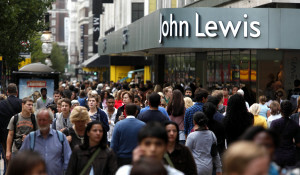 John Lewis is shortening its returns policy from 90 days to 35 days. The retailer highlighted rapidly changing product ranges as one reason behind the change. John Lewis has extended its contract with iForce, the supply chain company that provides online fulfilment services for the retailer. iForce was chosen by the company back in 2002 to support the launch of its online retail store. This year’s Black Friday turned out to be one of John Lewis’ busiest shopping periods, according to the retailer. John Lewis and Clipper Logistics are to create a Click & Collect joint venture company to offer a dedicated next-day delivery service to other UK high street stores. Clipper Logistics has signed a ten-year contract with John Lewis – it will be responsible for retail support services from its Northampton distribution centre. The John Lewis Partnership reaffirmed its commitment to investing in supply chain and IT despite a fall in profits in the first half of 2016. John Lewis has invested £150million in a new customer-centric distribution centre at Magna Park, Milton Keynes. The centre is designed to achieve faster replenishment for branches and customer deliveries.